So don’t ask if Depth Effect is perfect. A better question is if its failures are distracting. And I have certainly taken some test photos where they are. But the funny thing about test photos is that there’s often nothing worth photographing in them, so you just stare at the problems. In my own testing, whenever I’ve pointed Portrait Mode at something I actually care about, the results have been solid. To my eye, Apple’s blur is obviously not gaussian, or even gaussian-esque. It’s some kind of sharp-edged circular blur kernel, maybe computed at a lower spatial resolution than the final image, which would account for some of the softness — and the miraculous speed with which the iPhone 7 Plus can do the job. Samples of the original color render target are taken along a disc, with the radius of the disc based on the blur factor calculated from the depth texture. This can produce a more realistic bokeh effect, and also opens up the possibility to simulate the bokeh produced by various lens types. In this context, the disc blur effect is being applied to a 3D render, but Apple’s application of it to photography likely utilizes a similar technique. Very clever, and far more realistic than an ultra-soft gaussian blur. After publishing our second article about the phenomenon, which is being called “touch disease,” my inbox flooded with stories from people who—many out of blind brand loyalty to Apple—have continued replacing their iPhone 6 Pluses with refurbished units that are just as likely to break as their old ones. As we’ve detailed in those stories, “touch disease” is an iPhone 6 Plus flaw related to “bendgate” in which the two tiny “Touch IC” connectors, which translate touchscreen presses into a machine input, become unseated from the phone’s logic board. It can be recognized by flickering gray bars along the top of the phone, and is associated with intermittent or total touchscreen failure. In the last 24 hours, I’ve gotten emails from 27 separate iPhone 6 Plus owners who have encountered this problem and were unaware that Apple internally considers it a known issue. Many of them have been put through lengthy tech support protocols on obviously broken phones only to be told that they would have to pay $329 for a refurbished phone that is still fundamentally flawed. Others have had to put up with months of forcefully bending or twisting the phone in order to get its Touch IC connectors to intermittently work for a few minutes, hours, or days before the problem inevitably resurfaces. It seems pretty unfair to expect customers to shell out for a refurbished phone that will exhibit the same issue because of the engineering defect. Moreover, a few of the customers Koebler cites seem to have experienced unhelpful customer service while trying to get the problem resolved. This is something Apple ought to be making right, not making more complicated. When there was an known engineering defect in my mid-2007 MacBook Pro, I took it in for the out-of-warranty repair program. They didn’t have any of my model’s logic boards in stock, so they replaced it with an upgraded version that had a better video card and faster processor, at no charge. That’s the kind of customer service users who are reporting this problem should be getting: either upgrade them to a 6S Plus which doesn’t exhibit the same issue, or refurbish the 6 Plus in such a way that the ICs are reinforced. With­out di­min­ish­ing the ef­fort that’s been put into this new stan­dard, I’m not con­vinced there’s a plau­si­ble ra­tio­nale for it. It would im­pose sig­nif­i­cant costs on type de­sign­ers, pro­vide no ob­vi­ous ad­van­tage to our cus­tomers, and mostly ben­e­fit a small set of wealthy cor­po­rate sponsors. A variable font is a single binary with greatly-reduced comparable file size and, hence, smaller disc footprint and webfont bandwidth. This means more efficient packaging of embedded fonts, and faster delivery and loading of webfonts. “But cus­tomers ben­e­fit from smaller file sizes too, be­cause that makes web pages faster.” Cer­tainly, that was true in 1996. And some web de­vel­op­ers per­sist with po­lit­­cal ob­jec­tions. But with to­day’s faster con­nec­tions — even on mo­bile — op­ti­miz­ing for file size is less use­ful than ever. That is, of course, a problem of today. There is, of course, the possibility that your cellular carrier will suddenly become charitable and allow everyone to use large amounts of data at very low monthly costs, but — if the way ISPs have behaved for the past twenty years is any guide — I foresee an increase in costs to users, not a decrease. For rea­sons un­clear, this claim about net­work la­tency has al­ways pro­voked howls of out­rage among the web-dev Twit­terati. Folks, let’s work from ev­i­dence, not su­per­sti­tion. For ex­am­ple, here’s a quick test I did this week, with home pages ranked in or­der of load time. As you can see, load time cor­re­lates more strongly with num­ber of re­quests than down­load size. And Prac­ti­cal Ty­pog­ra­phy beats every­one but the world’s biggest cor­po­ra­tion. I’m seeing the transfer of eleven different font files every time I load a Practical Typography page without caching. Butterick could cut those requests down to just three — one for each typeface used on the page — by using OpenType Variations, and have a faster site as a result. There are plenty of factors other than raw file size that affect load times, of course: the speed of the host’s connection, what kind of servers they use, the number of requests, the route that the connection takes between host and destination, and more. But optimizing all of these things is absolutely critical if you care about how your site loads if a visitor happens to have one or two bars or a crappy Midtown connection. Even if they have five bars or they’re using a gigabit connection, it’s just polite, especially when a site is little more than text. Vitali Kremez, a cybercrime analyst at Flashpoint, is more skeptical of InfoArmor’s findings. “They might have jumped the gun too early on this,” he said. Yahoo’s announcement of the leaks only said that “the vast majority” were encrypted with bcrypt. It’s possible that InfoArmor’s subset of data is just the first few million database rows, which would likely be the older accounts — I suspect those would use MD5. Finally conceding defeat in a battle lost long ago to Apple Inc. and Samsung Electronics Co., BlackBerry is handing over production of the phones to overseas partners and turning its full attention to the more profitable and growing software business. It’s the formalization of a move in the making since Chief Executive Officer John Chen took over nearly three years ago and outsourced some manufacturing to Foxconn Technology Group. Getting the money-losing smartphone business off BlackBerry’s books will also make it easier for the company to consistently hit profitability. According to their Q1 2017 results — which were released in June because BlackBerry’s fiscal years are bizarre — their revenue in software services increased by $29 million compared to the year-ago quarter, while revenue from hardware sales and service access fees1 declined by $117 million and $146 million, respectively. Reduced manufacturing costs is how another fruit-themed company helped stem its losses, too. BlackBerry said it struck a licensing agreement with an Indonesian company to make and distribute branded devices. More deals are in the works with Chinese and Indian manufacturers. It will still design smartphone applications and an extra-secure version of Alphabet Inc.’s Android operating system. BlackBerry phones — and BBM, their proprietary messaging app — are still fairly popular in Indonesia. However, the iPhone is a significant status symbol there, and their middle class is growing (along with a rapid rise in inequality). If those projections remain accurate, the market for BlackBerry will be eaten up by iPhones and Android phones within just a few years. Maybe BlackBerry can make a comeback, but I doubt it. Update: Three of the best journalists in tech have compiled a short list of reasons why BlackBerry has struggled with its hardware sales these past few years. People don’t like to feel that their personal and private photos are being pored over, even if “just” by a machine. But these local silos have, at least at the moment, made the feature less useful, because the analysis happens on each device that the new Photos is on. That means even if all the photos on your iPhone are scanned for faces, when you upgrade your Mac to Sierra, the Photos app there doesn’t benefit from the information on your phone—even if they’re all the same photos. Not only does that seem remarkably inefficient, but it also runs into possible collisions. For example, I store my pictures in iCloud Photo Library: My MacBook Air running Sierra and my iPhone 7 running iOS 10 both have my entire 23,154 photo library synced. And yet, if I look at the People album in iOS 10, it identifies 12 people; my Mac’s People album has only 11. Moreover, the total numbers of photos for each of those people largely differs between the two. For example, my phone identified 523 pictures of me; my Mac, only 306. Those are some pretty disparate numbers, and a search for photos on one is sure to look substantially different from the other. And if I make changes in one place to add in more photos to a certain person, I’m just going to have to repeat that process on my other devices. Apple has previously stated that identified objects and people won’t sync — at least, not initially — for privacy reasons. I was under the impression that iCloud was extremely private and secure — again, this is what Apple has been saying for a while. Like Tsai, I don’t get how storing photos in iCloud is totally private, but it’s not yet possible to securely keep associated metadata in sync, too. At WWDC this year, Craig Federighi strongly disagreed with the argument that privacy and cloud features are competing interests. I’m inclined to believe him; I don’t think that privacy must be compromised in order to provide services that are proactive or user-tailored. I hope that my belief isn’t too idealistic, but Apple’s argument gets harder to agree with when rudimentary gaps remain in existing features. This article is striking for its summary of how dependent we’ve become on opaque algorithms we know very little about. The developers of these applications treat them as proprietary, and resist any sort of public or regulatory scrutiny. The combination of little oversight and wide use is, to put it mildly, quite terrifying. I will absolutely be reading O’Neil’s book. “For some reason.” How this ever got past any sort of quality assurance I cannot imagine. Did the engineer/s assign an out-of-bounds error code to the problem, and the operating system can’t decide what to say and so falls back to “for some reason”? I got the same error message back in April while opening a Pages file from a shared drive after a reboot. No clue what it meant then, and it was fixed with a restart of Pages so it doesn’t seem to overlap with Arthur’s cause of error. It does seem to be specific to iWork apps, though. Just now, I opened up Music and tapped the “For You” tab to see what it thinks I should be listening to. For some reason, it’s suggesting Linkin Park and Coheed and Cambria, two artists I’m not fond of. So, I went ahead and tapped the “dislike” button on both. Both albums are still in my recommendations and, presumably, will remain there until For You is refreshed. There appears to be no way to do that manually. Similarly, I think that the items displayed in “Browse” should be somewhat tailored as well. There’s no reason to suggest the new Luke Bryan record — nothing in my playback history suggests that I would be even remotely interested in that record. There’s a clear solution to a lot of these issues, and Apple has already implemented it. The two new playlists cited by Buzzfeed are among the most accurate I’ve seen, but there are just two of them, and they’re refreshed weekly. It remains a complete mystery to me why the rest of Apple Music’s recommendation features are not using iTunes playback and rating data, nor the previously-collected Genius data. Of all the rumoured buyers so far — Google, Microsoft, Salesforce, Facebook, and others — Disney is my preferred option. The others are either institutional (Microsoft and Salesforce) or horrific for privacy (Google and Facebook). Disney is a media company, and that’s rapidly what Twitter is becoming — and, arguably, what Twitter has always been. Korolova and her student Jun Tang discovered that Apple had lumped in the mention of differential privacy under two different diagnostic sections in iOS 10. With iOS 10, opting in to having diagnostic and usage data sent automatically to app developers means that users are also automatically subjected to data collection using differential privacy. It seems that if a user wants to submit diagnostic data to developers, but not be subject to the collection of this new data, they’re out of luck. Most of the non-technical people I know will try to get through the long iOS setup process as quickly as they can, and they don’t necessarily read each page in full. Virtually everyone I know has disallowed the submission of diagnostics and usage data and, consequently, opted out of differential privacy features as well. If differential privacy allows Apple to collect data while keeping it entirely non-specific and unidentifiable, it should be presented as a great way to make every iOS device smarter while keeping information private. But the entire setup process also ought to be shorter, while allowing users a similar level of control over their privacy and security. Though this may seem paradoxical, I think the critical factor in the unfriendliness of the setup process is the number of pages and options presented. This could be made less intimidating by, for instance, storing as many options and settings as possible in iCloud, and allowing the user to confirm them on a single page during setup. Something like that would go a long way towards making a shorter setup process that asks less of the user, gets them using their device sooner, and maintains their privacy. I have so many questions about this, but I have just one big one: how did nobody notice this? If I didn’t turn up for work for a month, people would notice. People would ask questions. Heck, I would ask questions like How am I maintaining two full-time jobs at the same time? and Why am I trying to maintain two jobs that have a clear conflict of interest for both parties? I’m sure Patel and the rest of the Verge’s editorial staff are furious about this, but I bet a small part of them is a little bemused by Ziegler’s pluck. I don’t know what Ziegler is doing at Apple, but he’s not the first journalist they’ve hired over the past couple of years: Anand Lai Shimpi and Chris Breen both left their publications for Apple, and the company has sought more journalists for Apple News, too. No word on what Ziegler is (or was? — several little birdies have told me Ziegler is not listed in the company directory) doing at Apple. …that’s not normal. Even the Proj Titan people are in Directory. Ziegler is indeed not in the directory. Maybe he’s working an an Apple Story? Apple Inc. and Google made tweaks to their popular mobile web browsers recently to enable video content to play automatically in web pages, provided audio is muted. The changes could result in a boost in mobile video consumption for online publishers if they allow their videos to play automatically, and it could unlock new revenue opportunities as a result. Looking forward to my cellular carrier finding more revenue opportunities for all of the data this is going to use. Canadians already pay the highest prices for cellular contracts in amongst developed countries. I certainly don’t want to pay for overages when a website like Mic or iMore decides to load an autoplaying video ad somewhere on the page. I’ve set up a rule in 1Blocker, in the Hide Page Elements package, to block video[~autoplay]. This is broad, but it should prevent autoplaying video elements from loading in Safari. I certainly hope circumstances like these are not as pervasive at Apple as Mic’s Melanie Ehrenkranz initial report suggested. However, a followup report contains new allegations that are somewhat evocative of that Amazon article from last year. That’s concerning. There’s something very unsettling about the way tech companies are responding to these big security breaches: none of them informed their users with anything resembling a sense of urgency. Dropbox waited four years to tell users about their 2012 hack, and only did so after lying about why they were resetting users’ passwords. Tumblr waited three years. And then there’s Yahoo. They didn’t tell users about the breach in 2012, even after Vice’s Joseph Cox asked about it earlier this year. Today, Kara Swisher and Kurt Wagner of Recode have a comment from Verizon — who are currently in the process of acquiring Yahoo — stating that they didn’t know about the 2012 breach until two days ago, and they only discovered the 2014 hack while investigating the one from 2012. All of these responses are incredibly irresponsible. Nobody should be finding out that their personal details have been floating around underground message boards for years. These breaches ought to have been publicly acknowledged immediately. Earlier today, Kara Swisher reported that Yahoo would be confirming the breach of 200 million accounts said to have been compromised in 2012. Swisher was, unfortunately, wrong — the breach turns out to have occurred in 2014, and the size of it is unprecedented. This far eclipses the impact of the previous record-holding breach — a set of nearly 360 million MySpace accounts, ostensibly leaked by the same hacker, “Peace” (PDF), responsible for the 2012 breach. Also, you read that right: Yahoo is blaming this attack on a “state-sponsored actor”. They haven’t disclosed any more than that, but in a June interview with Wired, Peace claimed to be Russian and working on behalf of a Russian “‘team,’ if you want to call it that”. Peace is also responsible for the earlier leak of 65 million Tumblr accounts, originating sometime in 2013. It’s unclear whether there’s some overlap between the two data sets, as Yahoo acquired Tumblr that same year. Update: Clarified the role of Peace in the 2012 attack. According to Google, the change was made to improve Allo’s smart reply feature, which generates suggested responses to a given conversation. Like most machine learning systems, the smart replies work better with more data. As the Allo team tested those replies, they decided the performance boost from permanently stored messages was worth giving up privacy benefits of transient storage. Or, to put it another way, Google made their development of Allo easier by making it significantly less friendly to your privacy. Earlier today, Apple pushed out a developer preview1 of iOS 10.1, which includes the “Portrait” camera mode for the iPhone 7 Plus. Panzarino’s test shots look decent, but when Serenity Caldwell posted a side-by-side comparison with a DSLR, it was obvious to me which was which. There is an inherently more natural fallout from the point of focus that can’t be simulated with the nine slices of depth generated by the iPhone’s dual cameras. But these photos are extremely impressive, especially from a smartphone. It’s a simulation, sure, but a very convincing one when these photos are shared on Instagram or Facebook. William Wilkinson also posted some tests on Twitter — featuring a cat instead of a baby — that are worth taking a look at. I’d love to give this a try, but I’m not sure it’s enough to convince me to choose the Plus model over the regular iPhone. I was almost sure that it would be a people-only thing, at least initially, due to the way Apple was wording the feature during its event and in its press materials. As Apple often does, it under-promised and over-delivered; that much is obvious, even in this early beta stage of the game. There is a familiar set of rituals the tech press follows in the weeks after an Apple event. It starts as a keynote happens, with hurriedly-written takes on the lack of surprises, written by someone who kept up with industry rumour blogs leading up to the event. Initial impressions from the hands-on area follow, most of which seem to laud the quality and impressiveness of the products just announced. Then, after one-to-two weeks of mixed takes and boredom, the reviews follow, bringing with them an enthusiastic bout of excitement for the products. And then, shortly after the first round of product delivery, a mood sets in that I like to call the “Post-Launch Hangover” — a sort of But what have you done for us lately? feeling that takes over the editorial pages of major tech publications. While Apple says it has hardware to beat all-comers, I’d argue it doesn’t: it has beautifully designed devices with close to, but not quite, top-of-the-range specs. It’s true, though, that this has been good enough for it to maintain excellent margins on massive volumes of sales and to keep people eager for more. But to my mind, Apple is in danger of becoming boring. I’m not sure why Woods hedged his assessment of Apple with an “in danger of” clause. His article is almost entirely about how tired he is of Apple’s hardware in the present, rather than in the future. The point here is that everyone is busy trying new things and really pushing the boundaries while Apple sticks to the tried-and-true formula. While in the short term Apple’s momentum will continue and the profit train won’t suddenly crash, the long-term picture is somewhat grim given that the company derives over 50% of its operating profits from the iPhone. For proof of that, you need look no further than Apple itself. Read any iPhone 6 review, and the design talk paints Apple in the same light as always; Apple design is good. The iPhone is beautiful. But new iPhone designs have typically brought new ideas with it. The iPhone 6 simply adopts the pre-existing design language of the iPads and covers it in ugly antenna lines. So: a long and not particularly proud tradition of tech journalists collectively yawning at the new products that Apple releases. A couple of days ago, Rene Ritchie posted a photo on Instagram of his original iPhone stacked on top of an iPhone 7 Plus. Even if you were to remove the Apple logo from both cases, there is a clear lineage. The iPhone 7 is — again, as Gruber notes — simultaneously new and familiar, and that’s a hell of a feat. It’s curious that Curtis mentions the TiBook while writing about his exhaustion with Apple’s industrial design team. At the time, it was a radical new design, but Christopher Phin of Macworld compared it to a 15-inch MacBook Pro and they are also, clearly, cousins. Apple’s professional laptops seem to have changed very little in their immediate aesthetics since the TiBook was introduced. But that’s fine. Apple has long been a company of iterative processes. While the iPod Nano was an ever-changing product, the iPod Classic of 2007 differed little in its overall aesthetic from the model launched in 2001. Similarly, the iPhone has arguably changed its design language just twice from the time it was introduced: to flat edges, with the iPhone 4; and back to curved sides, with the iPhone 6. My first-generation iPod Touch meets my iPhone 6S. Those two products may have been released eight years apart, but they are clearly of the same family. The sameness goes back even further: the original iPhone had solid coloured front and a metal back, like the original iPod, and that aesthetic was brought to the Mac as well. There are some who will see this as laziness or a lack of creativity, but design is so much more than the way these products look. Apple has become very good at lots of things over the years, but their main innovations in the past few have been in elevating the quality of their high-volume products while trying new ideas on smaller scales. My iPhone 6S feels like a flattened original iPhone. I’ve previously made known my dislike of the antenna lines and the misaligned camera bump — blessedly fixed in the iPhone 7. 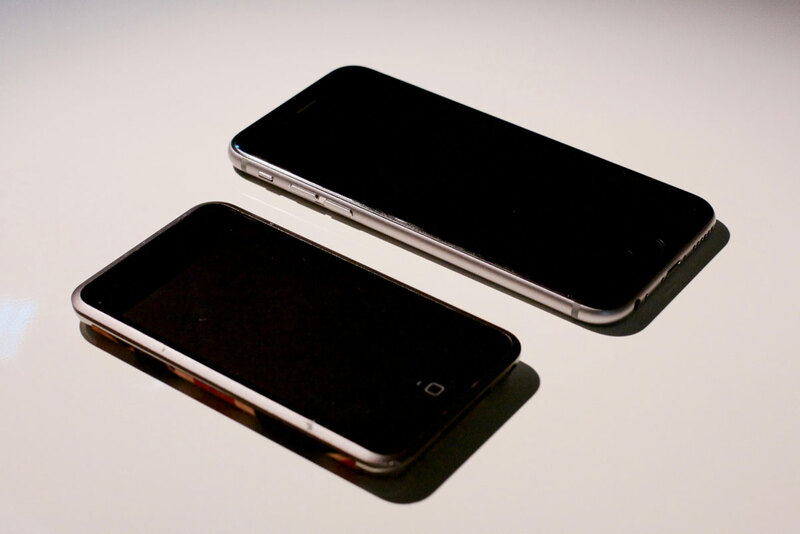 But, aside from the size of its display and its thickness, the original iPhone feels noticeably different. It feels like multiple parts, rather than the singular form is seems to be. There are gaps between parts and minor misalignments that would drive today’s Apple absolutely crazy. My 6S, on the other hand, feels like a continuous shape. The edge of the curved glass meets the rounded edges flawlessly. None of the buttons move in any direction other than inwards. The power button and volume controls all feel the same. The iPhone 7, particularly in the new Jet Black finish, seeks to push this even farther by making the entire phone feel and look like a singular form. And they’re doing this at the scale of tens of millions of iPhones every quarter. A similar obsession with solidity and uniformity has spread to Apple’s other product lines. The iMac, the MacBook, and the iPad are all designed to feel like the most rigid, solid products you can buy in their respective classes. The little things Apple has been chipping away at — solid-state trackpads, laminated displays, and lower tolerances — add up to make the latest generation of each of their product lines feel less like they were assembled from multiple components, and more as though they were spawned into existence as entirely finished units. I do understand Curtis’ frustration with the lack of the new, however. One thing you’ll notice is that many of the innovations he cites — from the original iMac to the iPhone 4 — came about as a result of a change in materials. And Apple has, indeed, been working with new and different materials at relatively small scales. It’s safe to say that no other company understands aluminum as well as Apple due to the scale at which they use it and study it; few others parallel their knowledge of glass, too. But they’ve also used gold, sapphire, Liquidmetal, and — with the new Apple Watch Edition — ceramic. It seems to me that they want to be as rigorous as they can be in their research of new materials, and that often means trying these materials in smaller quantities or with less-impactful applications. Sapphire, you will recall, was first used for the camera lens cover on the iPhone 5, before making its way onto the home button and Touch ID sensor in the 5S. The 63 was, according to many early rumours, supposed to be fitted with a sapphire display cover, but supplier troubles required a change of plan. This is the risk with using new materials at the scale of the iPhone. The Apple Watch, on the other hand, is shaping up to be similar to the iPod. The aluminum model is the least expensive, and it’s the material Apple has the most experience working with. Stainless steel is something Apple has worked with less frequently, but they’ve previously used it on the iPhone 4 and 4S and it’s one of the most commonly-used materials in the world. But that’s then; this is now, in our Post-Launch Hangover. I have very little idea what the future may hold, but I know what the present holds. And I don’t see anything boring about what I’ve seen this year, nor do I see this as some kind of downfall for Apple’s famed industrial design team. They’re pursuing the same strategy they always have: refine, iterate, repeat. It’s slow, tedious work, but it results in products that are built with unparalleled care and finesse at unprecedented scales. Evolution is slow to see when you’re witnessing it in real-time, but when the iPhone 14 — or whatever — is released, we will almost certainly be able to look back and see that it is a clear descendant from the original iPhone while still looking new. That’s not boring; that’s designing an icon. It notifies you when you should leave to catch the train or bus, to walk faster if it detects that you’re going to miss your ride, and more. For straightforward daily commutes, this probably won’t be that useful. But for those of us who take public transit everywhere or for unfamiliar cities, this is going to be amazing. If you’re dependent on public transit and you use any app other than Transit, I’m not sure we can be friends. Update: Jonas Wisser tried the GO feature on an hour-long commute and found that it’s hard on battery life. Keep that in mind when you try it out.